As the political, economic and cultural center of Shandong Province, Jinan is situated in the middle of the west part of Shandong Province with Zibo to the east and Tai&apos;an (and Mount Tai) to the south, backing onto the Yellow River and facing Taishan Mountain, whose topography lowers from south to north. Jinan also produced a hostof talented people in history, represented by Bian Que — a medical scientist of the Spring and Autumn Period (770 BC-476 BC), Zou Yan —a master of the Five Element Theory of the Warring States Period (475 BC-221 BC), Fang Xuanling—Prime Minister of the Tang Dynasty (618-907), and Li Qingzhao — a famous female poet of the Song Dynasty (960-1279). The greatest poet in Chinese history, Li Bai wrote many poems praising the beautiful natural scenery and cultural relics of Jinan during his lifetime. Jinan is a famous tourist city with mountains, springs, rivers, lakes and ancient cultural relics perfectly combined as one.It has long been famous as “the Spring City” in China owing to its four springs: Baotu Spring, Heihu (Flying Tiger) Spring, Wulong (Five Dragon) Spring and Zhenzhu (Pearl) Spring. With a history of over 4,000 years, Jinan is very rich in historical relics, including the site of the Shun (an ancient tribe leader) culture of the 3rd century BC, the Great Wall section of the State of Qi, the Simen Stone Pagoda built in the Sui Dynasty, and the painted sculpture of Arhat in Lingyan Temple which was built in the Song Dynasty（960-1279）. In addition, the Thousand-Buddha Mountain, Daming Lake, Red Leaves Valley and Water Curtain Gorge are wonderful natural scenic spots to explore in Jinan. 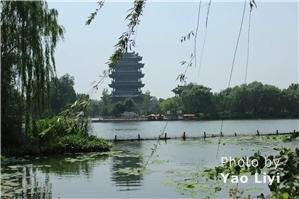 Located in the temperate zone of East Asia, Jinan has a sub-humid continental monsoon climate with four distinct seasons, featuring a dry spring, a hot and rainy summer, a cool autumn and a cold winter, where the annual even temperature and precipitation are 14.3°C(57.7°F) and 660.7 millimeters, and the hottest and the coldest temperatures are 40.5°C(104.9°F) in July and -14.9°C (5.18°F) in January respectively. The best times to visit Jinan are from April to October, and you can have a chance to appreciate the red leaves at Red Leaves Valley in autumn. Jinan dishes belong to Shandong Cuisine (one of the eight famous cuisines of China), featuring fresh, tender, savory and crisp foods, which have an emphasis on selecting condiments and cooking techniques.The famous Jinan dishes are represented by fried carp with sweet and sour sauce, chicken cubes in chili sauce, roasted pork intestines, two fried crispy ingredients, the Yu’s braised chicken and Jinan roasted duck. In addition, Jinan snacks such as steamed dumplings, spiral cakes and fried dumplings are also favored by locals and foreigners alike, and the noted restaurants in Jinan are listed as follows. 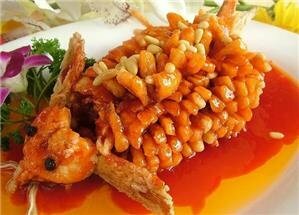 This restaurant features authentic Lu dishes (Shandong dishes), whose signature dishes are fried carp with sweet and sour sauce, and roasted pork intestines. Therestaurant is well-known for its local-flavored steamed stuffed buns and porkmixed with cucumber. The signature dishes in therestaurantare bean threads and marinated meat in a baked bun. The signature dishes in therestaurantare pickled chicken feet andred-cooked eggplant. Therestaurantis famous for its barbecues of various kinds in Jinan. Hotels and hostels of Jinan are of various levels and are well-equipped with modern service facilities, which you can select according to your budget, and you’re advised to book a hotel in the city center so that you can easily visit famous attractions in the daytime and appreciate the night scene as night falls. Below are the highly-recommended hotels and hostels in Jinan. Jinan is the transportation hub of Shandong Province, where a transportation network consisting of airways, highways, waterwaysand railways has been formed, and it’s easily accessible from the major cities of China. 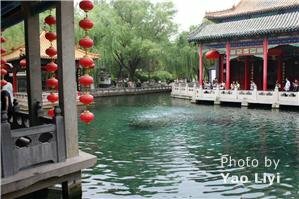 The inner-city transportation, such as public buses and taxis, are also very convenientin Jinan. Yaoqiang International Airport is located in Yaoqiang Town, 30 kilometers (18.6 miles) north-east of downtown Jinan, where the domestic flights to and from Beijing, Changsha, Chengdu, Chongqing, Dalian, Guangzhou, Guiyang, Haikou, Hangzhou, Harbin, Kunming, Nanjing, Nanning, Shanghai, Shantou, Hainan, Shenyang, Shenzhen, Wuhan, Yantai, Hong Kong and Zhangjiajie are available each day, and the international flights to Jeju of South Korea, Bangkok of Thailand and Moscow of Russia depart from the airport as well. The airport buses (20 yuan each) shuttle on the hourfromYuquan Senxin Hotel to the airport from 6:00 am to 6:00 pm each day, which pass Heping Road, Erhuan East Road and Jingshi East Road in succession. You can also take a taxi from Jinan city center to the airport with the ticket fare of 80 yuan. For those visitors whoare going to start for the airport from Shimen, you can take bus 3, 70, 75, 84, 89 or 121 to the airport. In addition, the coaches from Zibo (at Meigui Hotel) to the airport departat 5:00 am, 8:00 am, 10:00 am, 12:30pm, 2:00 pm, 4:00 pm and 6:00 pm each day. The coaches from Dongying (at Shengli Square) to the airport depart at 4:00 am, 8:30 am, 11:00 am and 2:00 pm each day. The coaches from Tai’an (at Taishan Hotel) to the airport leave at 5:30 am, 8:00 am, 12:00pm and 2:00 pm each day. Jinan Railway Administration is stationed in Jinan, making it the biggest transportation hub of Shandong Province. Jinan is 490 kilometers (304 miles) away from Beijing, 968 kilometers (601 miles) from Shanghai and 393 kilometers (244 miles) from Qingdao. It is the largest railway station in Jinan, from which you can reach the major cities such as Beijing, Shanghai, Xi’an and Guangzhou of China. The trains from the station are mainly for Dandong, Taiyuan, Qingdao, Taiyuan, Luouyang, Beijing and Weihai. 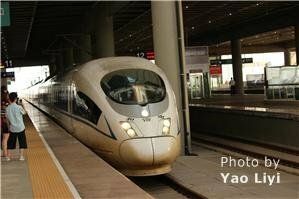 The trains from the station are mainly for Hangzhou, Xuzhou, Tianjin, Fuzhou, Shanghai and Beijing. Beijing–Shanghai Highway, Jinan–Qingdao Highway and Jinan–Liaocheng Highway run across Jinan, where there are seven major bus stations listed below. Bus Routes: 4, 5, 12, 22, 29, 32, 33, 35, 45, 67, 72, 84, 111, 114, K50, K53, K57, K58, K68, K90, K92, K95, K107 and K108. Bus Routes: 10, 47, 80, 87, 95, 99, K53, K95 and K50 as well as trolleybus102 and 103. Bus Routes: 3, 4, 5, 9, 11, 15, 18, 32, 33, 34, 35, 43, 49, 78, 21, 83, 98, 113, 118, K51, K58 and K67. Bus Routes: 4, 27, 35, 36, 41, 63, 64, 67, 76, 88, K52, K55 and K93. Bus Routes: 78, 81, 38, K56, K58, K96 and K98. Bus Routes: 7, 12, 15, 67, 85, K90, K91 and K107. Bus Routes: 4, 5, 30, 82, 84, 85, 111, 112, 114, 203, K50, K53, K57, K58, K68 and K90. Jinan public buses are composed of the common onesand the K-series ones, and the ticket fare is just one yuan for the common ones but two or three yuan for the K-series ones. A number of tourist buses such as (游)66, K51, K68, 88, 3 and 5 are also available in the city. Over 9,000 taxis are availablein Jinan. The starting price of a taxi is 7 yuan for the first three kilometers (1.9 miles), and 1.5 yuan per kilometer will be charged after that.